located in the "Liberty"district, quieter than the city center and fill in lovely restaurants, shops and several greenery. The same structure is able to offer a dual aspect: the charm of the past being restored from a historic building and the comfort of modern furnishings and amenities. The Hotel Principe di Villafranca Palermo is a perfect accommodation for both work and leisure stays and it is suggested for solo travelers, couple and families. Located in the heart of Palermo, Hotel Principe di Villafranca Palermo is precisely placed in the Liberty side of the city, close to the shopping street "Via della Libertà" and the squares "Piazza Castelnuovo" and "Piazza Crispi". At walking distance are the main historical monuments and the fascinating old town, while the closest beach "Mondello" is about 10 km away. The international airport Palermo "Falcone e Borsellino" is 30 km away from the hotel. Completely restored in 2010, Hotel Principe di Villafranca Palermo ensures the high quality standards of the HotelSphere collection. The structure is characterized by a sophisticated atmosphere, ancient Sicilian furniture, fine fabrics and design lamps. The hotel hosts 32 guest rooms, the Lounge Bar and the restaurant "Il Principe e l'Oste", which serves traditional Sicilian cuisine with local products Km 0. The rooms of the htel present essential shapes and white color which create a striking contrast with the bold colors of paintings by contemporary Sicilian artists. The provide all comforts and the rooms typologies differ in size and additional amenities. The breakfast is based on local and fresh products and served at the lounge bar of the hotel. If you would like to taste the typical Sicilian cuisine, the Restaurant "Il Principe e l'Oste" offers the best traditional dishes, prepared with local products Km-Zero (fish, vegetables). The Hotel Principe di Villafranca Palermo can provides a beach and Spa service thanks to special agreements with good partners. A professional staff is at your disposal for any additional services you may require. The Superior single rooms are characterized by essential shapes and white color which create a striking contrast with the bold colors of paintings by contemporary Sicilian artists. 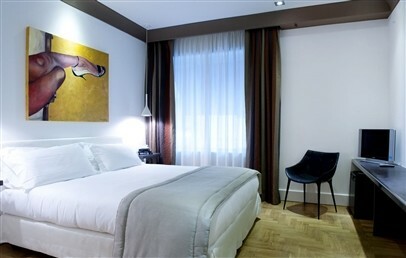 The provide all comforts: air condition, Lcd TV, Wi-Fi and minibar. The en-suite bathroom has the shower, hairdryer, slippers and complimentary toiletries. The Single Superior rooms overlook the city or the courtyard. The Superior rooms are characterized by essential shapes and white color which create a striking contrast with the bold colors of paintings by contemporary Sicilian artists. 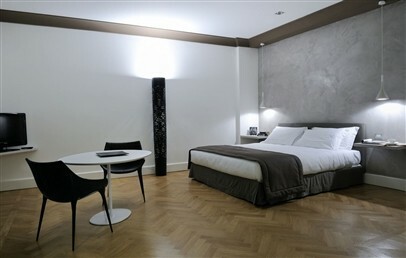 The provide all comforts: air condition, Lcd TV, Wi-Fi and minibar. The en-suite bathroom has the shower, hairdryer, slippers and complimentary toiletries. The Superior rooms overlook the city or the courtyard. 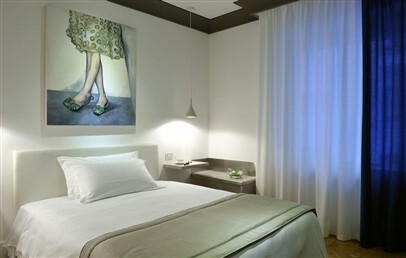 The Deluxe rooms are characterized by essential shapes and white color which create a striking contrast with the bold colors of paintings by contemporary Sicilian artists. The provide all comforts: air condition, Lcd TV, Wi-Fi, minibar and coffee/tea facilities. 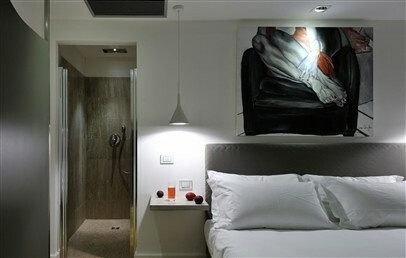 The en-suite bathroom has the shower, hairdryer, slippers, bathrobe and complimentary toiletries. The Deluxe rooms overlook the city or the courtyard. The Junior Suites are characterized by essential shapes and white color which create a striking contrast with the bold colors of paintings by contemporary Sicilian artists. 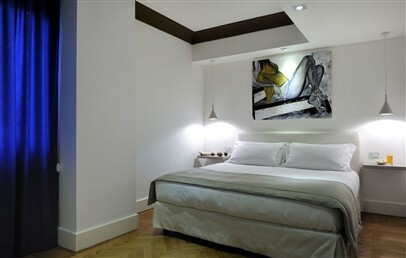 The provide all comforts: air condition, Lcd TV, Wi-Fi, minibar and coffee/tea facilities. 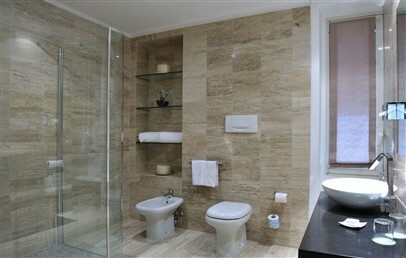 The en-suite bathroom has the shower or Jacuzzi tub, hairdryer, slippers, bathrobe and complimentary toiletries. The Junior Suites overlook the city or the courtyard.